The two buildings I compared are the Art Institute of Chicago that was apart of the original white city of Chicago and the Castle museum of Saginaw.What really is similar about these two buildings is that they both look medieval and have a renaissance look and style to it, except that the art institute has the Beaux-Arts style which is more of renaissance architecture but with ideas of Greek and roman architecture such as the pillars or columns of Greek and Rome architecture. Both Buildings feature long columns and arched windows and door ways . They are in ways both similar but very different such as the flat roofs of the Art institute and the stairs that lead up the building , the engravings in the walls and that very unique feeling of how everything that was put there was put there for a reason and it gives some kinD of meaning. As I said before the Beaux Style has borrowed elements from Rome and Greek architecture so that’s why it almost looks like it deserves to be in an old Greek movie but still looks like a medieval castle. The castle museum has had many renovations but it still looks bland in a way. It looks like a church but in fact it was really a post office. I think these buildings are very similar in many ways but are still totally different and to me the best building of the who would be the Art institute of Chicago. I agree that the arches in the entranceways and the second floor windows mirror each other. Those curves powerfully contrast with all the other sharp angles on The Art Institute of Chicago. It definitely draws the eye. Yet I think that the Castle Museum is equally attractive, but in a different way. The towers and turrets reinforce the curved geometry of the arches. I think this makes the Castle less imposing but more fanciful. It does seem a bit much for a post office!!!! During my first taxi ride in Chicago I saw this building. I agree with you about the arches and the engravings being deliberate and to look important. I also think the position of the building conveys importance. There is a road (can’t remember the name, sorry) that when you are driving down it, it looks like you are going to run right into it. Just that view of the building draws you in. I have never been to the Castle Museum but these two buildings do resemble each other. I do think some of the buildings look bland in Chicago but in a way it was their style back then. It was all very interesting to look at. 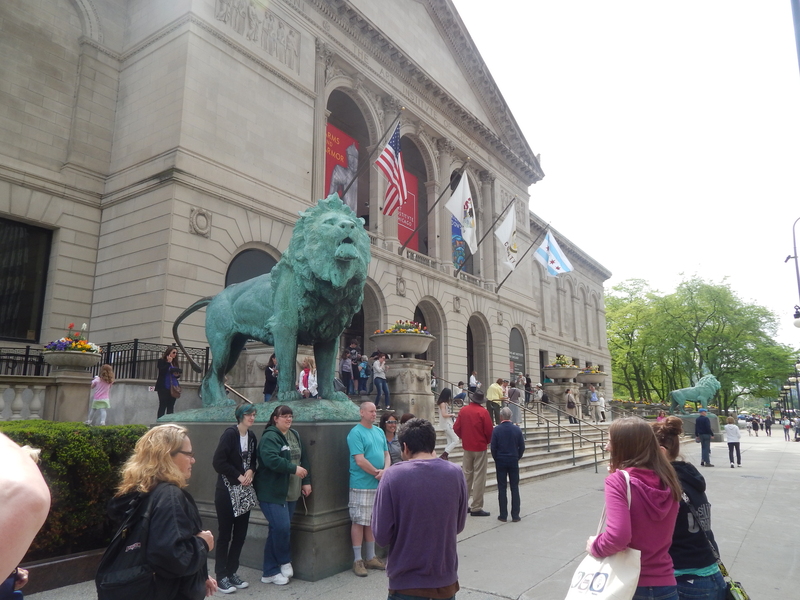 Having been inside the Castle I think that it pretty neat the building in Chicago had the big lions outside while inside of the Castle four lions head are in the main walkaway and are the originals from the outside. Pretty cool that two different types of styles would use the same animal. I never would have noticed the similarities between the Castle and the Art Institute of Chicago unless someone pointed it out. When I see the Castle I always find myself looking more towards the towers then the arches, but now that I noticed them, they really are amazing and work well with the rest of the building. For the Art Institute of Chicago, I think the arches are much more important to the building’s design and beauty. I actually learned while touring the castle museum for Michigan history class that the building was designed the was it is because during this time federal buildings were to reflect the heritage of the people in the community. So there is a little insight into Saginaw history!